With the long-term rise in Ed Tech investments - starting in roughly 2007 - many analysts have been predicting a fall for several years. Maybe not a bubble burst like we saw in 2001, but a real drop in activity and volume. Now we also find out that there is also a 70% drop in mergers and acquisition values for the education industry according to a new analysis by the investment bankers Berkery Noyes. Throughout 2016 we had plenty of signs that the change was finally here. I got into the act in response to a ludicrous TechCrunch article that concluded that Ed Tech was "2017’s big, untapped and safe investor opportunity". By the end of the year, there were several reports that investment (venture capital, private equity) had definitely gone down in 2016. Audrey Watters reported "The total dollars invested in 2016 are off by about $2 billion from this time last year". EdSurge reported a drop of 31%. CB Insights reported a drop of 32% (based on estimates for Q4). 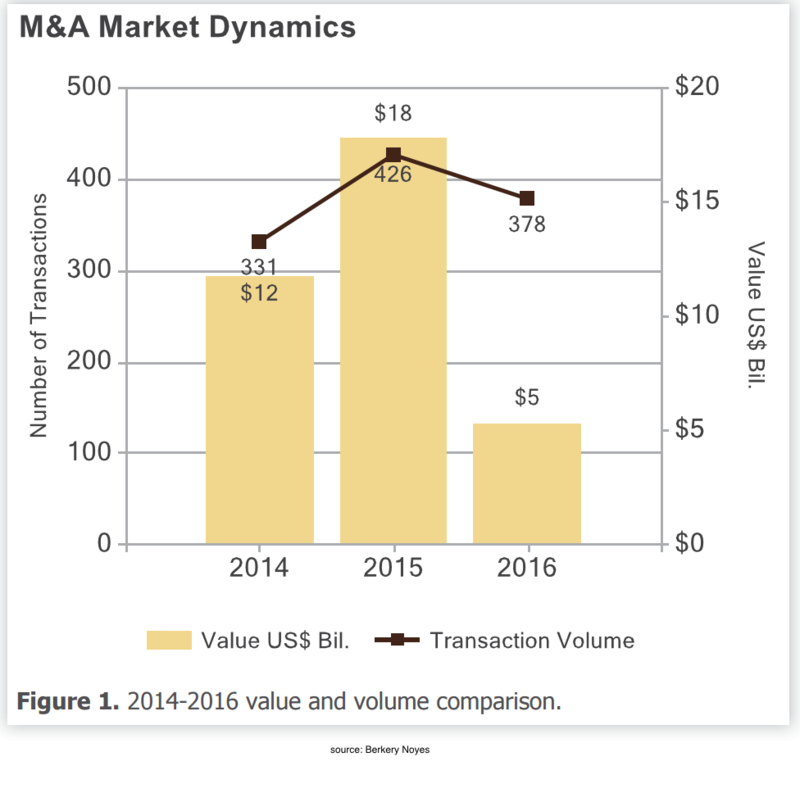 Total transaction value in 2016 fell by 70 percent over 2015, from $17.75 billion to $5.32 billion. This followed a 50 percent increase from 2014 to 2015. Audrey Watters, CB Insights, and EdSurge all track Ed Tech, but Berkery Noyes tracks the Education Industry (this includes for-profit schools and straight services as well). Nonetheless, note that M&A value is much larger than pure investment numbers. Further on in the report, Berkery Noyes notes that the biggest drop in terms of number of transactions was for Professional Training Services and Higher Ed Media and Tech segments. Another anecdote to consider is that there were no funding rounds for any of the MOOC providers. However you read it, I think it is quite clear now that the big drop in the financial business of Ed Tech is here. This is not just a blip in the data or one-time change - by all appearances (outside of TechCrunch offices) we have a new set of expectations and a new trend. Will this trend continue, stabilize, or reverse? We don't know, but let's stop pretending the change hasn't come. And this change in investments and M&A has and will have a real impact on the Ed Tech market. More companies are scrambling to try and become sustainable without new rounds of funding, but not all will succeed. I expect we'll see a number of companies go out of business or be acquired in distress sales. The companies who have strong financials have a chance to improve their positions. Institutions need to have backup plans in case vendors go away or change. On the positive side, I find that many Ed Tech companies have a more mature approach to the market, with less hype than a few years ago. I'm not arguing that we will have wholesale chaos, but some caution should be advised for both companies and institutions.